The Consequences of drunk driving in New Zealand can very harsh.For many people, drinking is a lifestyle – one that is probably more important than their lives. This is why some persons will still choose to get behind the wheels even after drinking themselves to stupor. As long as they get home safe and no one gets hurt, there’s no big deal. So why fuss about it? When you stuff yourself with alcohol just before driving away, you are not only endangering your life but also that of the people you meet along the way. Just because you haven’t crashed another car or knocked a pedestrian down doesn’t mean you’re thinking right by driving while intoxicated. It may not be today or tomorrow, but chances are that one of these days somebody is going to get hurt (this sentence reminds me of Russell Peters). And whether it’s you or someone else, the consequences abound. Every year, averagely 130 people die in road related accidents in New Zealand. And it’s no surprise that a significant percentage of these numbers result from the reckless driving of a drunk driver. Over the years 2014 – 2016 for instance, alcohol contributed to 29% of fatal accidents, 14% of serious injuries and 10% of minor injuries. This is why any form of intoxication behind the wheels is a serious crime and offenders are likely to come under very serious punishments. But even with government efforts at curbing this menace through legislative actions, a lot of people still throw caution to the wind. Just a little amount of alcohol in your bloodstream is enough to make you drive solo on the road, ignoring all warning signs. After consumption, alcohol may take as long as two hours to be absorbed into your bloodstream. During the long wait, your cognitive skills will be delayed which affects your driving ability. One of the adverse effects of alcohol is that it reduces your ability to take decisions properly. When this happens, your judgement and perception will no longer be sharp, and as such your ability to properly navigate a car is impaired. Funny enough, during this time, you will think there’s nothing wrong with the way you are driving. Until, of course, police catches you. Another danger of consuming alcohol behind the wheels is that it delays your ability to respond to different situations. Lack of awareness and inability to quickly react to what happens on the road is one of the major causes of road accidents. Now imagine yourself in this state when a pedestrian just appears in front of you from nowhere, or some other car just pulls up in front of you. Although you know you have to apply the brakes quickly but just because your brain is dull under the influence and cannot process the situation on time, you may end up knocking someone down or bumping into another car. 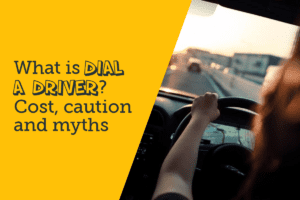 If you happen to fall into the league of the “heavy drinkers”, then you are more likely to encounter a lot of challenges in coordinating your motoring skills. When you drink up to the point where you can no longer stand straight, then you must have a second thought about driving. How do you expect to pilot a vehicle when you cannot even coordinate yourself? During such situations, staying away from the wheels is the best way to not getting into harm’s way. Taking a cab may actually be the best move. Even as little as 0.08% of alcohol in your bloodstream can impair your vision and concentration. A condition that is very dangerous if you plan to drive yourself. After leaving a heavy “alcohol session”, it is possible for your vision to become blur as you experience difficulty in controlling the movement of your eyes. Given how clear vision is important to navigate around other cars, identify traffic signals, remain on your lane and not go beyond the speed limit, driving with an impaired sight highly increases your chance of having an accident. When taken in moderation, alcohol is just another way many New Zealanders socialise and enjoy themselves. But whenever the fun goes on the road, then someone has to answer to the law. Drink diving is a serious offence and it’s not difficult to see why. Given the high rate at which police are arresting offenders these days, it is much safer for Kiwis to use a dial a driver service in the area whenever you are intoxicated. The minimum blood alcohol concentrate (BAC) for adult drivers (over 20 years) is 0.05% as from December 1, 2014. The legal breath alcohol limit is 250 micrograms of alcohol per litre of breath. Anything higher is termed as a driving under the Influence case and this puts you in trouble with the law. With regards to drink driving offences and it may interest you to know that the consequences are really harsh. To know more about drink drive offences click here. Whether you feel very sober or not, after few drinks, making the choice not to drive is the best decision. The consequences of drunk driving can be different for each person and in most cases, the worst happens. Every year we loose more than 100 precious lives in DUI related accidents. While hundreds are arrested and charged for the same. While there’s so much activity on the part of law enforcement agencies to stop drunk driving. This does not alone solve the problem. We need to take responsibility and avoid to drive while under influence of alcohol or drugs. The best option is to take a Dial a Driver service and protect your life and of others. You don’t want to make up the drinking and driving statistics, do you? PrevPreviousWhat is a standard drink in New Zealand and when can I drive?